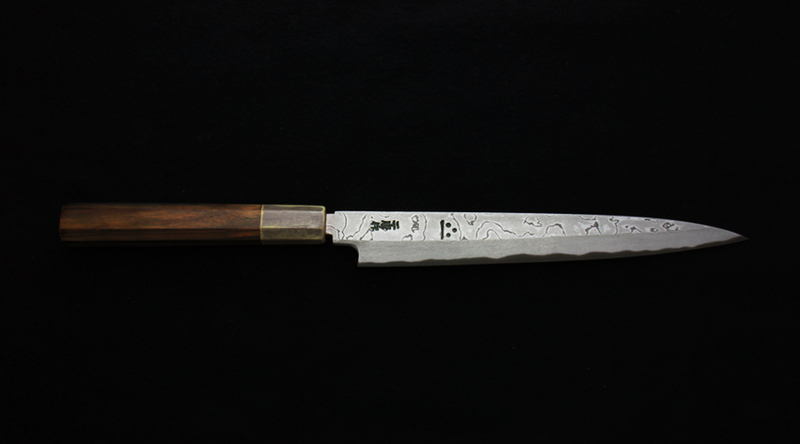 Japanese Knife “Wabocho” Japanese knife Nigara Forging Co., Ltd.
With the increased interest in Japanese cuisine and culture, of late, the Japanese kitchen knife has received grown attention from not only professionals but also from informed enthusiasts around the world. Japan has a well developed culture of bladecrafting as most prominently represented by the Japanese sword. It is said that swordcrafting was the first in traditional crafts to give birth to brand names in Japan. The craftsmanship of swords was first introduced by China and the Korean Peninsula, and took its own shape in Japan with the beginning of the Japanese sword production during the early Heian Period (794-1192). For the production of the Japanese sword, steel referred to “Tamahagane” is made by heating iron sand to high temperatures with coal. This process was passed on continuously between the masters of swordcrafting. After the Meiji Period (1868-1912), the Sword Prohibition Act was enacted and the manufacturing of swords was limited to military swords. However, after World War II, the Law for the Protection of Cultural Properties has allowed the production of Japanese swords as industrial art to this day. Japanese swords can only be made by master swordsmiths with proper qualifications. After the Sword Prohibition Act, many swordsmiths converted to blacksmithing. 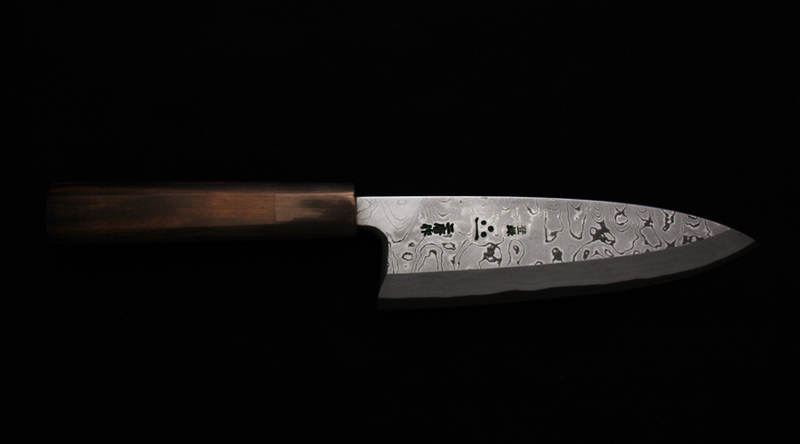 These skilled artisans developed the techniques to make forged steel cutlery, “Uchihamono.” such as kitchen knives and agricultural edge tools. The technique and tradition has been passed down over generations. The making of “Uchihamono” involves heating steel and soft iron in a forge and shaping the blade by hammering, a technique derived from the making of Japanese swords. 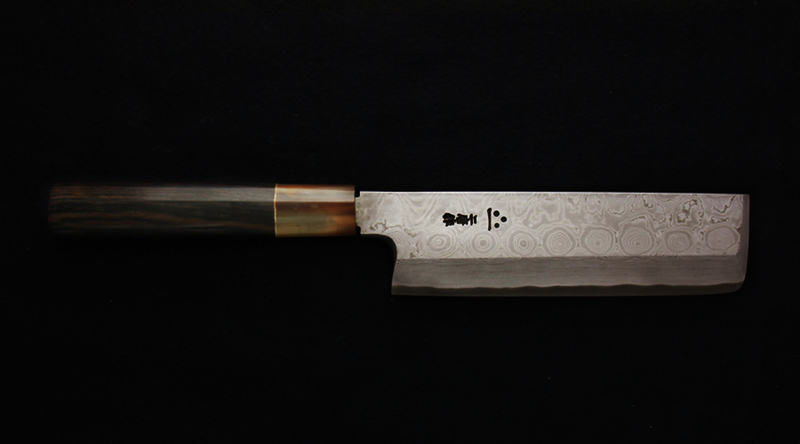 (For Meat) The Santoku Knife is an all-purpose knife suitable for cutting meat, fish, and vegetables. (For Sushi & Sashimi) The Yanagiba Knife is for cutting Sashimi (sliced raw fish and seafood), and is also known as the Sashimi Knife. 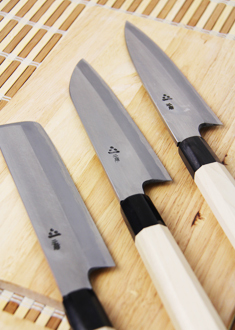 (For Fish) Mainly for fish, poultry, and bones, the Deba Knife is suitable for cutting tougher ingredients. (for Vegetable) The blade is wider and thin, allowing cutting hard vegetables such as carrots without cracking them. Japanese cuisine not only places a great importance in appearance, taste, and freshness, but also in the skillful cutting of the ingredient. There are many types of Wabocho to suit various seasonal ingredients and methods of cooking. The cutting edge of Wabocho is chiefly unilateral. By making the blade unilateral, it allows the knife to slice in an acute angle, resulting in a beautiful cut and appearance. The wabocho of Nigara Hamono is hand-made one by one by our expert craftsmen. 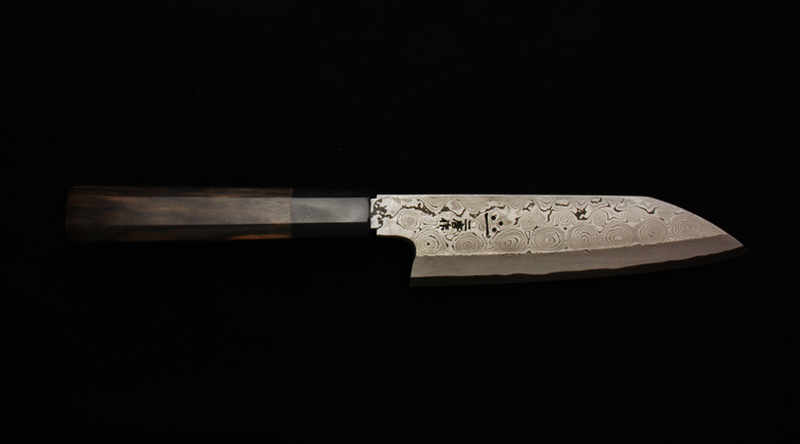 When western cuisine was introduced to Japan after the Meiji Period, western style kitchen knives were also imported. 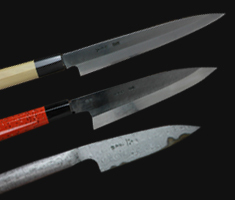 Around the end of Taisho Period (1912-1926), western kitchen knives began to be manufactured in Japan. Most of the current domestic manufacturing is done by machines.